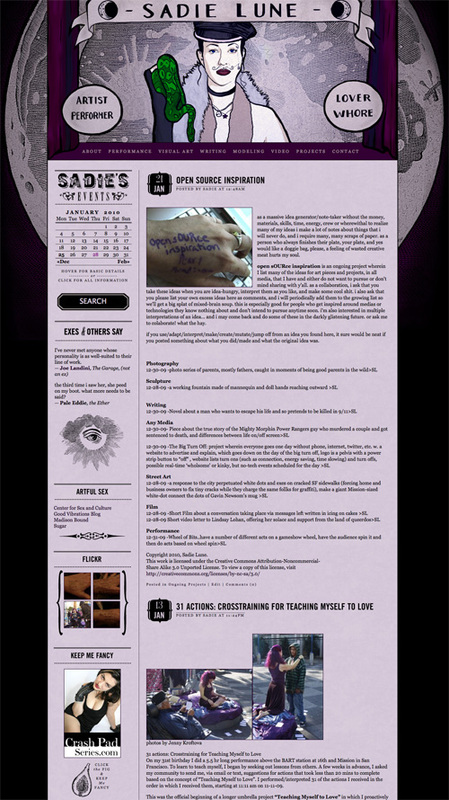 I recently had the pleasure of designing the personal site for performance artist, Sadie Lune. Sadie Originally said she wanted something that was “Freak Show meets Art Nouveau”, and I immediately knew I had to make her an illustrated header. I did a lot of design research on freak show and circus posters, as Art Nouveau was already a well-researched aesthetic for me. I was especially pleased with the integration of the header and the curtains. I also used a transparent graphic for the header, allowing the moon in the background to show through on the page. The moon remains stationary, as the picture of Sadie and all the content below, scrolls freely. As for the left sidebar and post headers, I wanted to continue the retro theme and incorporate an old newspaper feel. I mixed up a bunch of different fonts and graphics to try to achieve this. There are some other nice details to the site, like the event calendar on the left; which Sadie can use to not only put new events into, but can also create new posts automatically without having to reenter all the event information. I’m also particularly fond of the custom search bar, testimonials, and flickr galleries- which update automatically when Sadie updates her flickr. I’m really happy with how the site came out! I really enjoy the curtain feature at the top. Also, mixed typefaces for the win. .-= amandalee´s last blog ..First Postcarding of 2010! =-.